It’s not you, it’s me …. I really don’t understand why cooking has to be so hard. Take for example the crock pot. Why do you have to plug it in? Is it not enough to just turn it on? I can’t begin to tell you the number of times I’ve smugly thought to myself … “Won’t my family be so happy when they come home tonight and smell the deliciousness of dinner wafting through the air as they walk in the door?”. And then, as if it wants to bring shame to my name, when I go to take the lid off our dinner, I discover it’s sitting in the pot exactly like I left it, uncooked. Just last week I tried a new crock pot recipe for Mongolian Beef. I remembered to buy the ingredients and when I put it in the crock pot I remembered to turn it on AND plug it in. Miracles abound! But what I forgot was that I needed to put the food IN the crock pot earlier in the day. (Again, this is another reason why crock pots are tricky … I don’t think about dinner at 10 am or 2 pm or however many hours before I need dinner. I think about crock pots when I start to realize it’s almost dinner time). The recipe said to cook for 5-6 hours on low or 3-4 hours on high. I realized a little before 5 that I forgot to start it but I thought it would be ok. I’d cook it on high and whisper encouragingly to it … “hurry, hurry” … while it was cooking. Turns out the “hurry, hurry” command is really more of an insta pot thing. Much to my dismay, 2 1/2 hours later (which was the absolute very longest I could stave off my family before mutiny ensued), I called them to the table. It looked ok and smelled pretty good. As they scooped the meat out we realized the pieces which had cooked on the outside of the crock pot had cooked but were pretty tough. Poor Brittany got a piece from the middle that was not thoroughly cooked and when she screamed “THERE IS COW’S BLOOD ON MY PLATE!! !” … well let’s just say I knew who was going to be having a bowl of cereal for dinner. Anyway, a few days after the cows blood debacle I decided I could use some help from professionals so I ordered up a “Hello Fresh” delivery. I had a $30 coupon and a friend had told me she really liked it for her family. 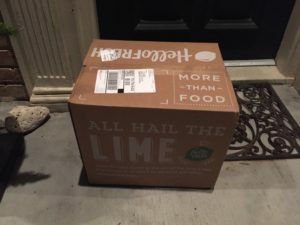 She showed me her box and how “Hello Fresh” sent the meat and spices and just everything you could possibly need for your meal. Plus they included step by step instructions for exactly how to make your dinner. (One thing I’ve realized about myself since I started seeing recipe videos online and cookbooks with pictures in them is that I am clearly a visual learner. Maybe things would have turned out differently in my kitchen if, when I got married, all the recipes in cookbooks had come with beautiful step by step pictures to guide me). 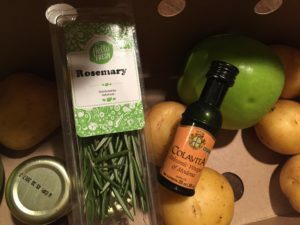 So I thought … “well, my goodness, Hello Fresh buys the food, delivers the food and shows you how to make it!”. What could possibly go wrong? And well, the first thing to go wrong was that I placed my order to be delivered on 1/17. I thought that meant it would arrive on 1/17 in the afternoon and when my family saw my cooking WITH SPICES and OLIVE OIL and ALL KINDS OF THINGS that I don’t normally cook with they would rise up and call me blessed. I knew Bill would praise my name at the city gate. There would be great rejoicing. But it didn’t happen that way because the food was delivered at 6:30 pm. Here’s the deal … Bill calls home pretty regularly late in the afternoon and says “What’s for dinner?”. (Sometimes I feel badly about the hopeful optimism I hear in his voice). Because he loves me and God loves me when I (fairly regularly) say … “I don’t know, I meant to go to the store … do you just want to go out” he usually says “sure”. (Step back ladies, he’s taken). But this day, well I thought this day was going to be different. I thought he would call and I would tell him the name of a very fancy recipe (which means it had more than three ingredients). I thought all would be well. All manner of things would be well. But when he called and asked what we were having for dinner I had to reply “well, what we were supposed to have” … and that’s as far as I got before he started to laugh. I’m telling you, he’s lived with this for a long time. (Have I ever mentioned the time when we were first married and I thought it would be fun to cook manicotti together? The recipe called for a clove of garlic and did you know a clove is only ONE of those little pod things? We reeked of garlic FOR DAYS and had to throw the manicotti out and go to Wendy’s. Like I said, Bill is used to me starting sentences about cooking with “Well, it was supposed to be … “). Anyway, I had to tell him that I was throwing together plan B which always means pasta. All the while I could not believe that even when I brought in professional help I still didn’t have a meal to serve. So just as the timer for the pasta went off the doorbell rang and there was my big “Hello Fresh” box. The box had such high expectations. It said we were going on a delicious adventure. I thought that might be a stretch. I was super excited to try the first recipe so I read the brochure and studied the pictures. 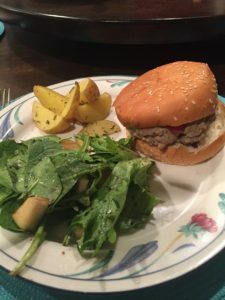 The recipe was for “Juicy Apple Pork Burgers”. I have to be honest here and tell you that I didn’t even know a pork burger was a thing. I knew of hamburgers and turkey burgers but now I know … pork burgers want a place at the table too. The box contained everything. I sliced the potatoes, peeled the rosemary off the stalk and tossed it with olive oil and put them in the oven. 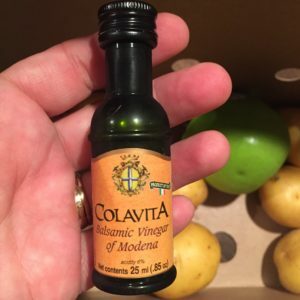 And isn’t this the cutest bottle of balsamic vinegar you’ve ever seen? Step two was to core an apple which did not go well so I ended up with apple slices. Then it said to grate the apple and THERE WERE NO PICTURES OF THIS STEP. Not that I really needed them but that just seemed weird to grate an apple … I mean who does this? But I tried it and followed the directions when it said to wring out all the excess moisture over the sink … and I added those grated apples and a little more rosemary to the pork and we were set. The recipe said to add a little olive oil to the pan and heat it and then cook the burgers for 4-5 minutes on each side. I made it about two and a half minutes before the smoke alarm started going off. Of course that doesn’t scare anyone in my house because basically it just means “mom’s cooking” … but still, it’s so loud. I tried adding more oil to the pan while I fanned the smoke detector and turned on the vent over the stove. (Why is cooking so hard?! This step was not in the pictures!). One thing I want to add here is that I was a little disappointed that the meal they sent me was burgers because I was hoping for something a little fancier, more elegant maybe. But perhaps they did a little research and felt that burgers fit my cooking capabilities and picked it for me. We sat down and it was moment of truth time. Would they like the pork burgers? Would anyone notice they were pork? What if I grated the apple wrong? Turns out I had nothing to fear. They weren’t bad at all. Good actually. Bill did say he would have rather had a hamburger instead of pork but I reminded him that pork is the “other white meat” and he let it go. And then today I got the survey wondering how we liked it, how things went … and I just didn’t have it in my heart to tell them about the smoke alarm. But should Hello Fresh happen to see this, please know … it’s me, not you. Of all the recipes in the world!! They want me to stir fry it so fingers crossed it goes better than the Crock Pot. If not there is always a bowl of cereal.